5 pm Wednesday to Saturday. We are comparing Florence Cheese and Wine Tasting Prices from leading ticket suppliers and Try to find you Cheap tickets prices on the market. Whether you're a couple on a city break, travelling with friends or taking your family on holiday, this short 1-hour wine and cheese tasting tour is a fantastic way to introduce yourself to Florence. Get familiar with the foods, wines and culture of the wonderful Tuscan province without leaving the city. Not only will you hear the history of wine production and farming in the region, you will also get to taste a variety of local produce, including full-bodied red Chianti Classico, Multipulciano and sweet dessert wines. Your expert sommelier guide will pair each wine with complimentary appetizers. All products are made from quality local produce. Bite into a classic bruschetta and sample some cheese slices, prosciutto, olives, cold cuts or fresh fruits. 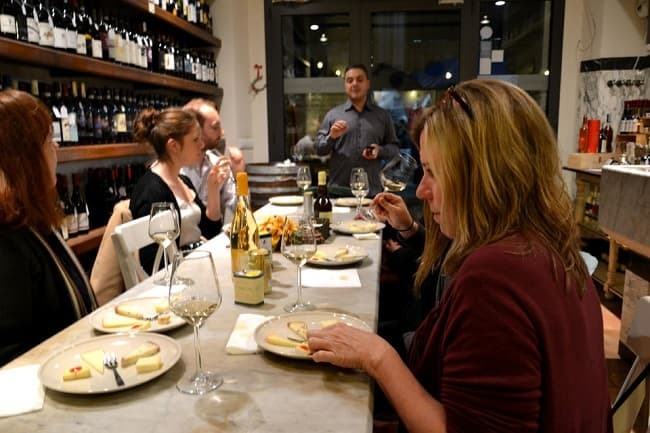 This wine tasting tour is held in a typical Enoteca (Winehouse) in Central Florence and numbers are limited to small groups to enable a relaxing social experience. If you'd like to learn about the eating and drinking culture within Florence and get some handy tips on where to dine in the city this tour is a good starting point. Your guide will introduce you to local foods and give you great tips for your remaining time in the city. Your Experience With Florence Cheese and Wine Tasting? Take a cultural walking tour of central Florence with a local resident guide. Taste a variety of Tuscan wines and typical appetizers in a traditional wine bar in Central Florence. Learn from your local guide about the history of foods and wines in the region. Meanwhile, enjoy the company of your fellow travellers as you taste local foods and beverages. Experience Florence the Italian way by combining a delicious food with excellent wine and good company. What Florence Cheese and Wine Tasting Includes? Wine, olive oil and food tasting. Expert English speaking sommelier guide. Remember that this is a food orientated tour so be sure to come with an empty stomach. Travelers Reviews about Florence Cheese and Wine Tasting? This 60-minute tour has 4.5-star ratings from over 200 travellers on TripAdvisor and Viator. The tour has fantastic 5-star feedback on Get Your Guide. Travellers agree that the food samples are delicious and the wine tasting is very nice. Comments also say that the host and guide are very friendly. Reviews point out that this tour is suitable for people of all ages. Please present tickets in print or electronic form. Cancellations must be made at least 3 days in advance to ensure a full or partial refund. Sample tasting menu is available on request. Meeting Point: Location will be confirmed in reservation.